Matt Kuerbis and Catharine Sutherland craved hot sauces which focusedon flavor rather than heat. They created sauces to suit their tastes, and to share with others. 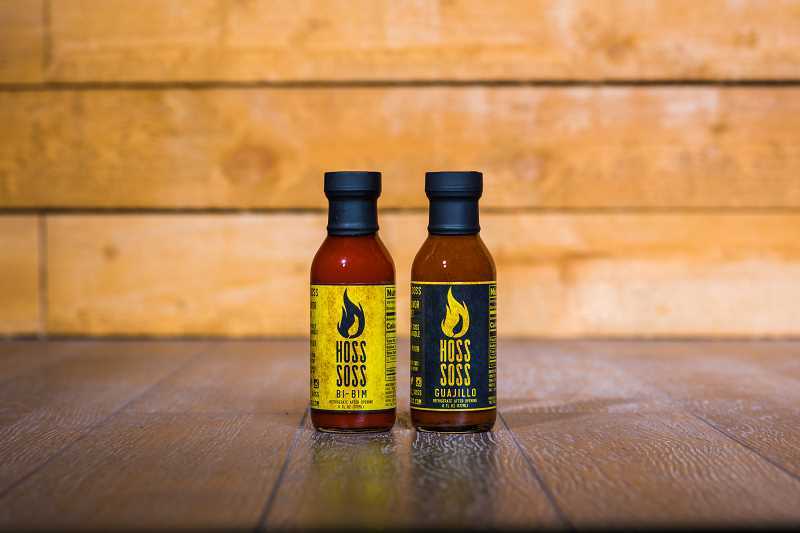 Partners Matt Kuerbis and Catharine Sutherland of Salem have launched Hoss Soss, a new line of hot sauces that "give addictive global flavors top priority." "We're excited to bring truly flavorful, unique hot sauces to the table," said co-founder and Chef Matt Kuerbis, former executive chef of Le Cordon Bleu College of Culinary Arts in Portland. Kuerbis and Sutherland began making the sauce in their ODA-certified home kitchen in August 2016. "We like to add some heat to our meals, but we kept buying hot sauces that were way too hot for our tastes. We decided to make our own sauces that pack a lot of flavor and a bit of heat, so you can really pour them on without burning your face off," he said. The company mantra is "heat you can handle," and the partners say they focus on flavor first and heat second, keeping the heat levels low so more people can enjoy the taste of the hot sauce without too much burn. Hoss Soss launched the brand with two flavors: Bi-bim (pronounced BEE-bim) and Guajillo (pronounced GWA-heeyo). Inspired by the traditional Korean dish bibimbap, Bi-bim features "the rich flavors of toasted sesame oil, tamari soy sauce, lime juice and a blend of red chili peppers." Guajillo takes its sweet and smoky essence from a host of tomatoes and roasted onions paired with guajillo, jalapeno and cayenne peppers. Both sauces are gluten free, preservative free and come in a six-ounce glass bottle. The couple is putting the final touches on New Mexico Mango, a tropical flavor for summer. "The name says it all," said Sutherland. "If you like the deep, earthy heat of New Mexico chiles and the sweetness of a juice ripe mango, you'll love this sauce as much as we do." The sauces are available locally at New Seasons Market and Market of Choice. Hoss Soss will be a vendor at the third-annual PDX Hot Sauce Expo taking place Aug. 4 and 5 at OMSI Bridge Lot, 1945 S.E. Water Ave., in Portland. Tickets are $7 in advance at pdxhotsauceexpo.com or $10 at the door. To learn more visit hosssoss.com.